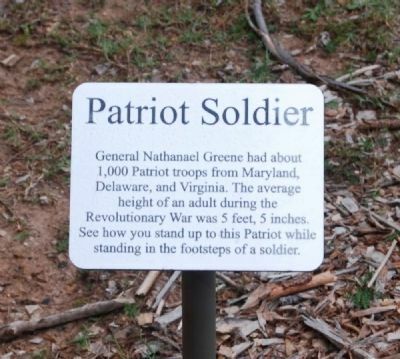 Revolutionary War was 5 feet 5 inches. while standing in the footsteps of a soldier. Location. 34° 8.868′ N, 82° 1.114′ W. Marker is in Ninety Six, South Carolina, in Greenwood County. Marker can be reached from South Cambridge Road. Touch for map. 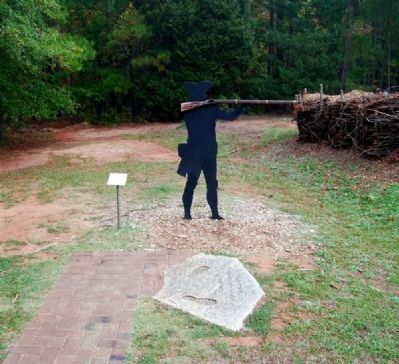 Marker is located near the observation tower on the north section of the battlefield. Marker is in this post office area: Ninety Six SC 29666, United States of America. Touch for directions. 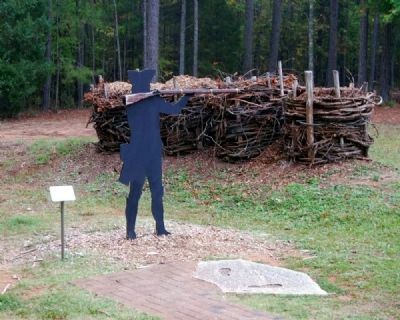 (within shouting distance of this marker); The Artillery (within shouting distance of this marker); Trader with Pack Horse (within shouting distance of this marker); Island Ford Road (within shouting distance of this marker); Approach Trench (about 300 feet away, measured in a direct line); Second Parallel (about 300 feet away). Touch for a list and map of all markers in Ninety Six. More. 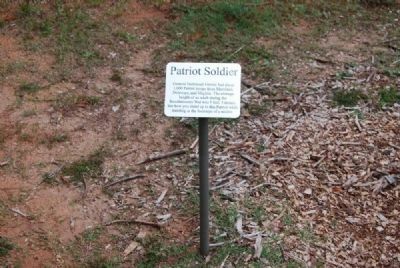 Search the internet for Patriot Soldier. Credits. This page was last revised on June 16, 2016. This page originally submitted on October 19, 2011, by Brian Scott of Anderson, South Carolina. This page has been viewed 434 times since then and 2 times this year. Photos: 1, 2, 3, 4. submitted on October 19, 2011, by Brian Scott of Anderson, South Carolina.